That's Sandi, our long legged Jack in the picture. She is there to provide perspective on the bean plants, growing up the fence, and provided more to climb up yesterday. 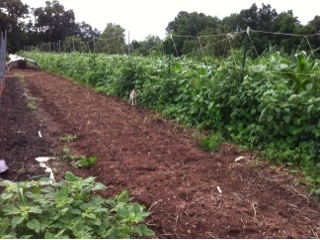 As the forecast is for sunny and warm weather, by next week we expect the beans to cover all the twine just installed. This is the best bean growing weather! Happy plants mean beans for all in a few more weeks. Yum.